Stock photo of the Monument to Multiculturalism located outside Union Station in downtown Toronto, Ontario, Canada. 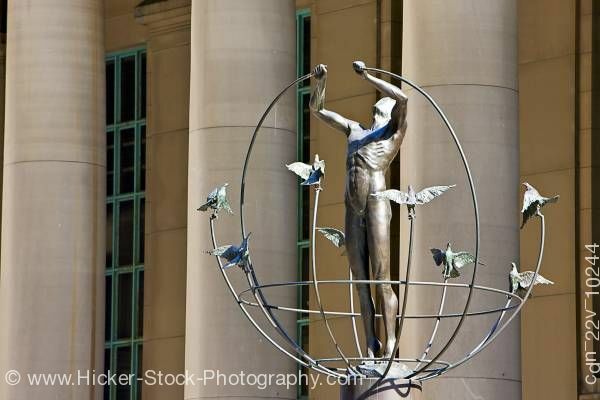 This stock photo shows the Monument to Multiculturalism located outside Union Station in downtown Toronto, Ontario, Canada. Created by Francesco Pirelli, this beautiful monument is an intricate and delicate work of art depicting a stylized world connected to a human form surrounded by doves. Unveiled on Canada Day, 1984, Toronto celebrated Canada's 150th birthday with a great piece of art. The monument is placed fittingly in front of the city's major transportation hub, which serves more than 60 million people of different ethnic backgrounds annually.